Sharks are fish, and fish lay eggs — right? It's true that some sharks are oviparous, meaning that pups develop in eggs outside the mother's body. 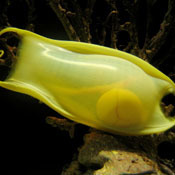 Usually, oviparous sharks grow inside fast-hardening cases, which some people call mermaids' purses. But not every shark species follows this pattern. Viviparous sharks, for example, give birth to live pups that develop inside the mother's body. This method is a lot like the way most mammals reproduce. The mother shark has a placenta, and the pups develop in her uterus. These pups start their development in yolk sacs with little yolk stalks, but later on during gestation these become the placenta and umbilical cord. Some sharks also take a middle ground between oviparous and viviparous reproduction. These sharks are oviparous species. The pups start out in eggs — often just thin membranes — but the eggs hatch while still in the mother's uterus. In some shark species, sibling rivalry ensues, or to be more technical, the pups engage in intrauterine cannibalism. In milder cases, this just means early hatchers will chow down on some of the late arrivals, eating up any unhatched eggs for nutrients. In extreme cases, such as with sand tiger sharks, also known as grey nurse sharks, a mother shark ends up giving birth to only two pups. And that's not because the two made a truce — it's just because mom has two uteri to keep them apart.